The move takes it to 20% above the level it stood at on Friday, according to the Luxembourg-based Bitcoin exchange, Bitstamp. It started the year at around $1,000. Virtual currencies are largely unregulated and bypass traditional banking systems. Their growth is of increasing concern to international regulators. China and South Korea have banned any new virtual currency launches and have been shutting down exchanges on which they are traded. JP Morgan Chase’s chief executive, Jamie Dimon, described Bitcoin at a recent conference as “a fraud”. “It’s just not a real thing, eventually it will be closed,” he said. 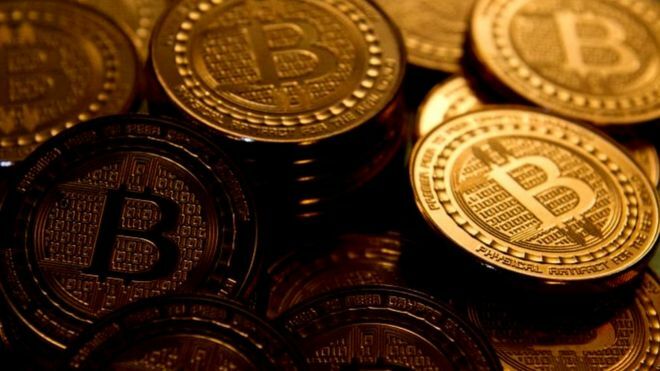 Currencies such as Bitcoin use blockchain, which is an online ledger of transactions maintained by a network of anonymous computers on the internet. They are not backed by any government, nor central bank and therefore there is no-one responsible for backing their value. European Central Bank policymaker Ewald Nowotny told Reuters news agency that Bitcoin “could easily blow up, and central banks could then be accused of not doing anything. This has felt like the latest, maddest speculative bubble, a tulip fever for the hi-tech era. 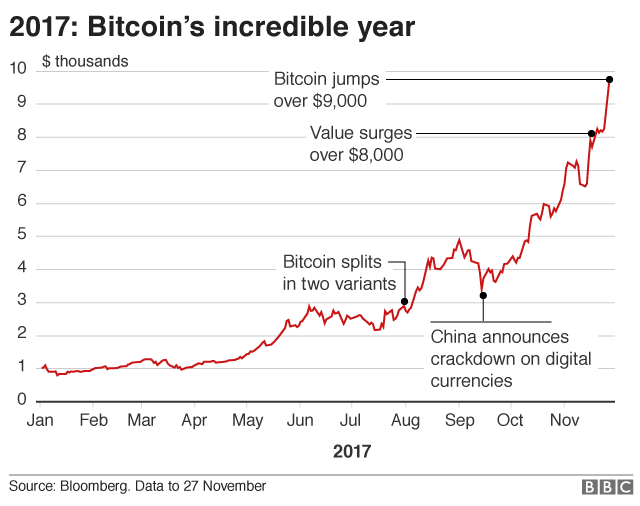 On its helter skelter ride towards $10,000, there have been plenty of occasions where Bitcoin has seemed in trouble – splits in the community over how it should be governed, robberies at exchanges, warnings from regulators. But every time that pundits have warned the bubble is about to burst, the currency has stuttered for a few days and then gone charging higher. 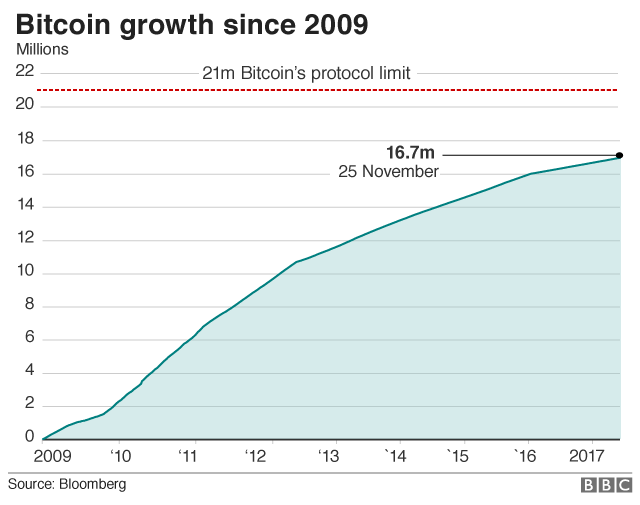 Some banks are looking at whether the blockchain technology that underpins cryptocurrencies could be of use to them as the world moves further away from cash transactions. The world’s leading derivatives exchange, the CME, said recently it planned to offer trading in Bitcoin futures in the near future, although it has not yet set a date. The potential involvement of CME has spurred the price of Bitcoin higher. Bitcoin is particularly susceptible to rumour. Mr Ahmad said there is also talk that Amazon is considering accepting Bitcoin as payment. There is also concern that Bitcoin could be vulnerable to hackers. Mr Ahmad said that recently it lost almost 20% in value on fears it was being hacked.